Amusing T-Shirt or Psychotic Redneck? If you know me, or have read any of my blogs, you know I love to cook. With this in mind, Andy bought me this t-shirt from woot. It is titled: Kitchen Warfare. It’s kind of extra funny because I’m really not into guns. To illustrate how NOT into guns I am I will tell you that the first year we were in Utah we went to Andy’s company Christmas party. As they were giving away all the prizes, the MC announced that the first person to reach him and show him their license to conceal would win a prize. I didn’t know what that was. I would just wear it among small gatherings of friends who will get the irony and know you will enought to understand that you’re being ironic, unless the looks and stares don’t bother you. 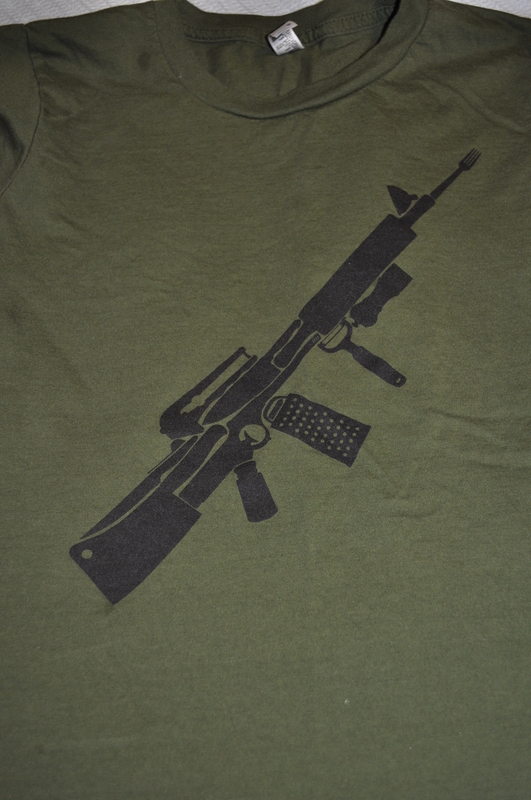 The general public will think it’s a gun especially since the t-shirt color is green. What’s ironic to me is that licenses to conceal are common place but wearing a shirt with a gun gets stares? I’m glad you like the shirt! Oddly enough, I don’t even own a gun. My only intention was to make a “tough” cooking shirt since there aren’t many out there. I appologize for the weird stares, though!